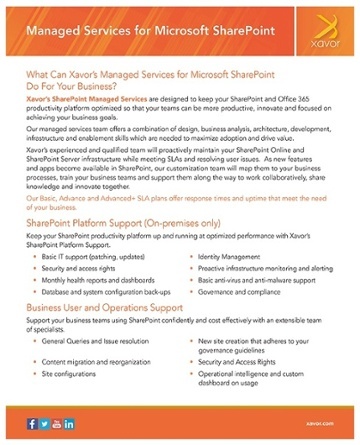 What Can Xavor’s Managed Services for Microsoft SharePoint Do For Your Business? Xavor’s SharePoint Managed Services are designed to keep your SharePoint and Office 365 productivity platform optimized so that your teams can be more productive, innovate and focused on achieving your business goals. Our managed services team offers a combination of design, business analysis, architecture, development, infrastructure and enablement skills which are needed to maximize adoption and drive value. Xavor’s experienced and qualified team will proactively maintain your SharePoint Online and SharePoint Server infrastructure while meeting SLAs and resolving user issues. As new features and apps become available in SharePoint, our customization team will map them to your business processes, train your business teams and support them along the way to work collaboratively, share knowledge and innovate together. Our Basic, Advance and Advanced+ SLA plans offer response times and uptime that meet the need of your business. Keep your SharePoint productivity platform up and running at optimized performance with Xavor’s SharePoint Platform Support. Support your business teams using SharePoint confidently and cost effectively with an extensible team of specialists. Enhance your SharePoint Online or SharePoint Server deployment with custom solutions to meet your changing business needs and achieve your goals faster. Xavor’s SharePoint team will evaluate new features, map them to the relevant value for your business, and drive end-user enablement to deliver measurable results. Enable your teams to make most of your SharePoint investment by providing ongoing learning and support to beginners and power users. For over 15 years, Xavor has helped hundreds of businesses harness the power of SharePoint. We know what SharePoint success looks like so we’ve created a Managed Services offering that allows your business to realize its full potential.